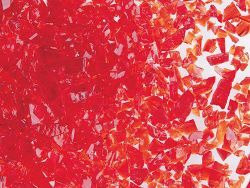 Uroboros frits are made from crushed, screened and cleaned 90 COE tested compatible sheet glass from Uroboros FX90 glass. Frits are packaged in clear wide mouth plastic 8.5 oz. bottles and 4 lb jugs. 1 4 pound jug equals about 7.5 of the 8.5 oz jars. Uroboros’ unique DualTone Frit is made from mixed color source glass so wide gradations of color are seen on each grain. In the coarser sizes, this allows for enhanced complexity and naturalistic, less pixilated, coloration in your frit work. The finer sizes can result in unique colors from the blending effect, colors you won’t find anywhere else.